Fabius Maximus (280-203 BC) saved Rome from Hannibal by recognizing Rome’s weakness and therefore the need to conserve its strength. He turned from the easy path of macho ‘boldness’ to the long, difficult task of rebuilding Rome’s power and greatness. His life holds profound lessons for 21st Century Americans. His controversial tactics earned him the honorific Cunctator, the great Delayer. (His other nickname, ‘Verrucosus’, came from his warty lip—or so claimed Plutarch.) Today he is credited as an inventor of guerrilla warfare and attrition tactics, at least among the US military establishment. For the right moment you must wait, as Fabius did most patiently, when warring against Hannibal, though many censured his delays; but when the time comes you must strike hard, as Fabius did, or your waiting will be in vain and fruitless. Cunctation (to use the rather rude-sounding noun) survived into the twentieth century—and presented itself handily in the context of our conference. Wolfson College is the home of one of our sponsors and the conference dinner/Mañanarama exhibition. Its founder, Isaiah Berlin, was a political philosopher and one of the century’s great public intellectuals. He was also a perennial procrastinator and perfectionist, preferring gossip and academic intrigue to the anxieties of work. In honour of the art of cunctation, and with the support of the Isaiah Berlin Literary Trust, we are offering a £50 prize for the best graduate paper of the conference. For more information, see here. So here’s to the gradual, the noncommittal, the dilatory. 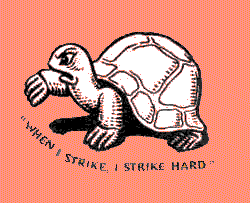 Here’s to the tortoises.